Dean’s Discussion: The Familiar Becomes Unfamiliar – Hearing the Prodigal Son through Music. 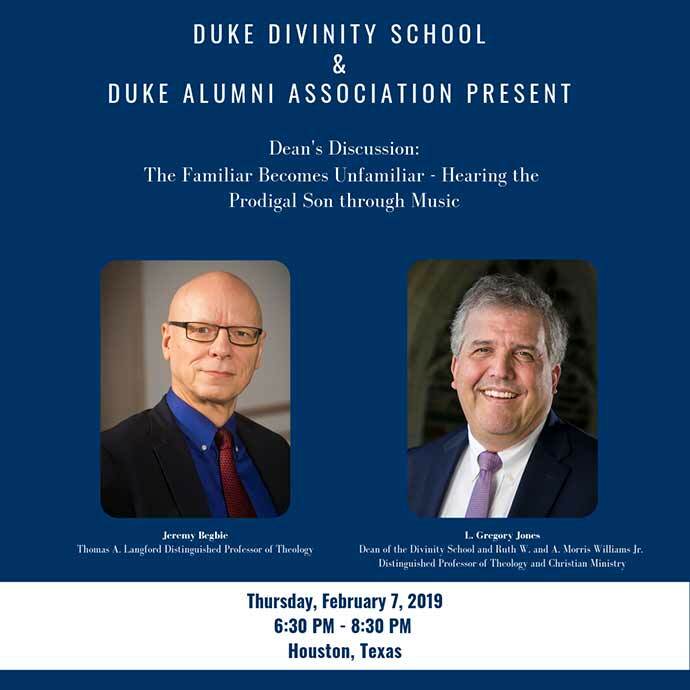 Dean’s Discussion: "The Familiar Becomes Unfamiliar – Hearing the Prodigal Son through Music" will be presented by Duke Divinity School Dean Dr. L. Gregory Jones and Dr. Jeremy Begbie, distinguished professor of theology and pianist. They will explore how our imaginations can be refreshed, so that we see familiar things in entirely new ways, and find new possibilities where we thought there none. Performing at the piano, Dr Begbie will show how music can help us re-hear one of the best known stories of all time. Dean Jones will then open up a wider conversation with the audience, exploring what this renewing of our vision might tell us about what it is to be human, and what it might mean to have faith in today’s world. Registration fee includes heavy appetizers, beer/wine/sodas/water.